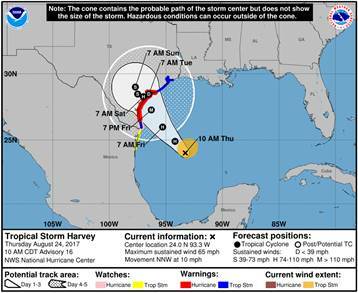 The National Hurricane Center has updated the forecasts for TS Harvey. As shown on the forecast, Harvey could become a hurricane later today and potentially reach Category 3 (winds over 110 MPH) strength as it approaches land. The forecasted path has shifted slightly back to the northeast from yesterday’s forecast and currently showing the center making landfill Saturday morning somewhere between Corpus Christi and the Matagorda Bay. The models are continuing to show significant rainfall for the Texas Coast. Harvey could bring widespread rainfall of 10 to 15 inches with isolated peaks of 20 to 30 inches throughout the storms impacted areas. The actual rainfall totals will depend on how fast or slow the storm drifts across the area. The biggest change since yesterday has been the strengthening of Harvey and the potential for heavy winds. Based on the 10 AM forecast update, the Greater Houston Area could see wind speeds between 60 and 80 MPH. Please remember to secure any outdoor items that could be impacted by winds. Any items left outside could become projectiles causing damage to homes or even injury to people. When possible, bring items in doors. As many of you are aware, the remains of Harvey have been updated to Tropical Depression Harvey. Based on the latest forecast from the National Hurricane Center, TD Harvey could redevelop into a tropical storm later today with potentially hitting landfall on Friday. Based on the models, Harvey could deliver a significant amount of rainfall to the Texas Coast. The forecast shows that the lower Brazos River watershed, including Fort Bend County, could see between 7 to 12 inches of rainfall with isolated areas of over 20 inches. The true impacts on the Sugar Land area will depend on the speed and duration the storm as it moves through the area. With the high potential, the District and their consultants are keeping a close eye on this storm and stand ready to respond as needed. At this moment, the internal drainage system is at or slightly below its normal levels with the main outfall channel open and clear. This means that 100% of the District’s flood storage capacity is available in the event we do see a significant amount of rainfall. The District’s pumps and generator are also ready to be operated if needed. As residents, please take a moment to review your own personal emergency response kits for your homes. Regardless of its impacts, this storm is a good reminder on how we need to always stand ready during hurricane season. 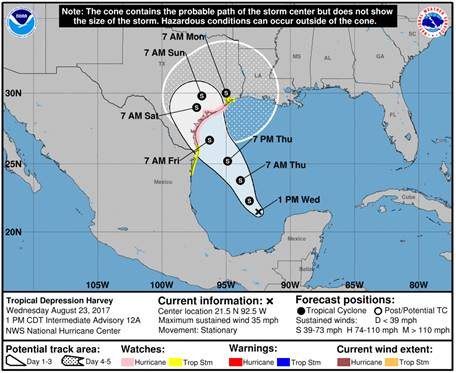 For more information on Hurricane Preparedness, please visit the Fort Bend County Office of Emergency Manager at http://fbcoem.org/hurricanes/ or the National Hurricane Center at http://www.nhc.noaa.gov/prepare/ready.php. As always, feel free to contact the District if you have any questions or concerns.